The fun, vibrant colors that adorn the walls and flooring, gives off an almost amusement park feel, and sets the tone for will definitely be a gastronomic journey that will take your senses by surprise. Our meal began with the incredibly addicting, Korean Fried Dumpling (P170). Minced chicken meat that is seasoned with an aromatic Soy and bits of Dried Shitake Mushrooms, is delicately wrapped into a tight dumpling, and deep fried. 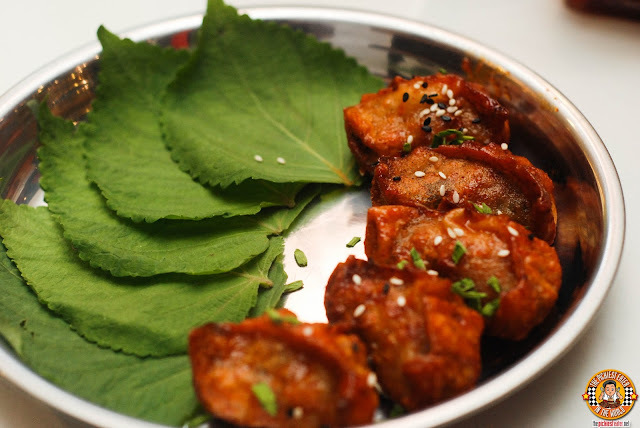 The dumpling is then glazed in I Am Kim's spicy sauce, which adds a wonderful kick of flavor to the dish. 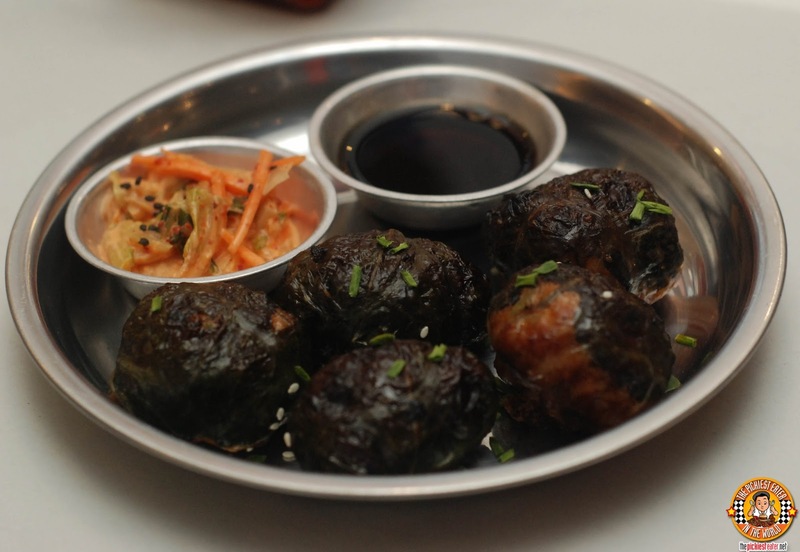 You take a dumpling and wrap it in the Shiso leaf, for an added fragrance to your bite. Truthfully, I was totally fine with the dumpling even without the Shiso leaf, although the greens made me feel less guilty. Definitely a must order among the starters. I'm not gonna lie to you, I initially thought that the Korean Sausage (P180) was Japanese Siomai, so I was reluctant to try it at first, since I'm not a fan of anything wrapped in Nori (Yes, even Spam). 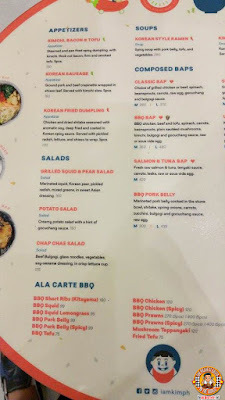 Good thing I double checked, because I would have been kicking myself if I missed out on another gem from I am Kim's Appetizers menu. A savory blend of ground pork beef, and an assortment of spices is packed together into a sausage. The sausage has a tartness to it that reminded me of Kimchi, but the vibrant flavor made reaching for another piece of sausage natural instinct. 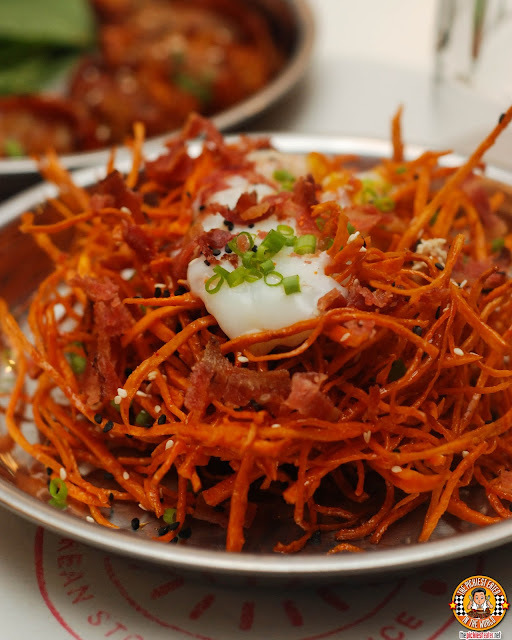 I fell madly in love with Chef Him's Gocuchang Shoestring Fries (P180), flatulence be damned. 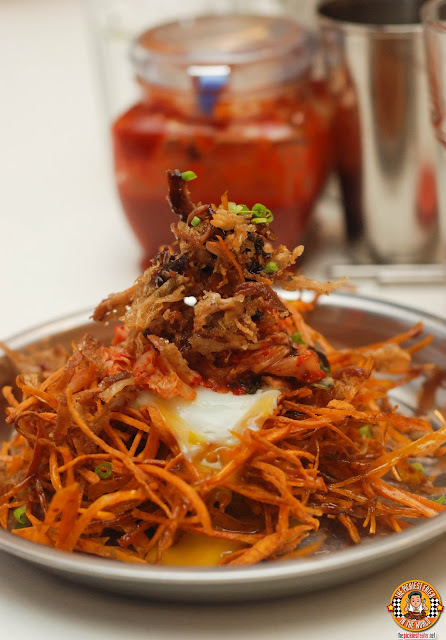 Thin sweet potato strings are deep fried to a golden hue, and coated in I Am Kim's Gocuchang Butter, with a perfectly cooked sous-vide egg nestled in the center. The pile of Hay is then topped with your choice of Bacon or Adobo Flakes. As you can imagine, I went straight for the bacon, however I must admit that the Adobo Flakes gave it a run for its money. 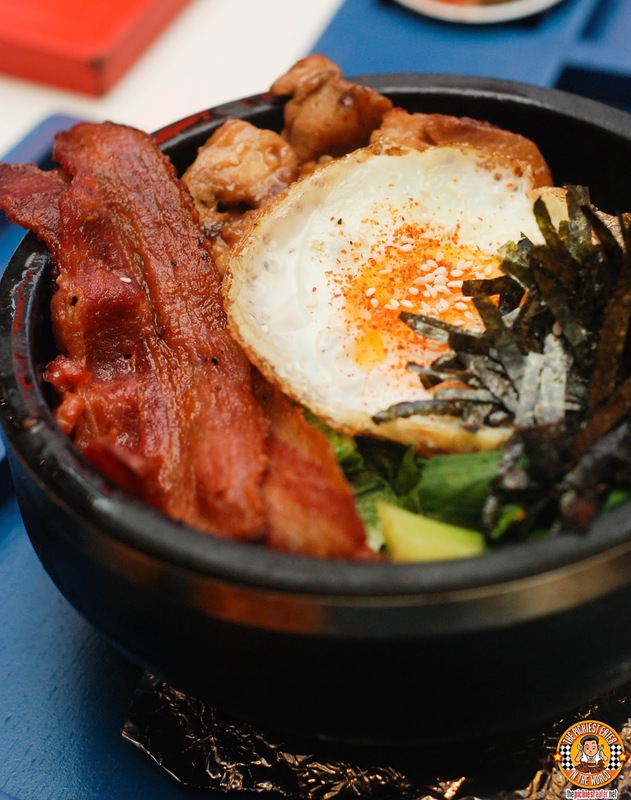 The beauty of I Am Kim stems from the fact that you may build your own Bibimbap to your liking. That loathing of cucumbers I was talking about? Not a problem anymore. Not a fan of seaweed? No worries. 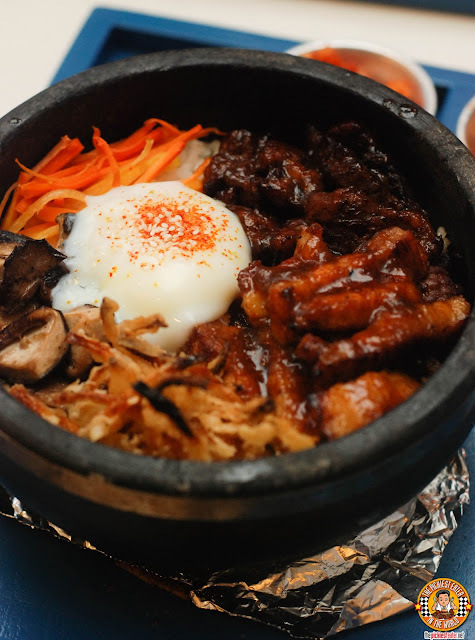 At I Am Kim, YOU are the boss of your own Bibimbap bowl. 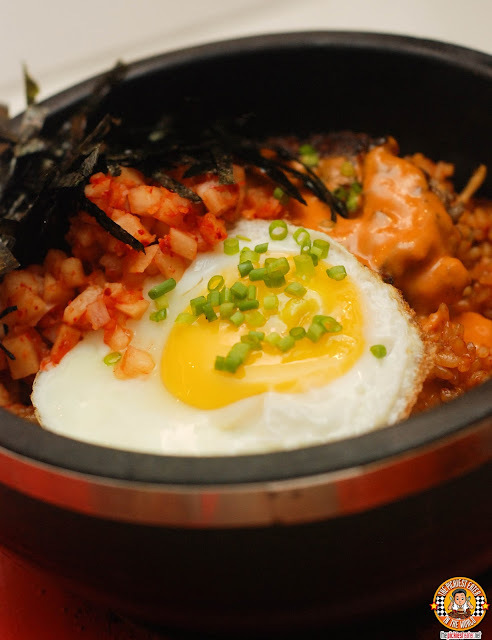 Making your own Bibimbap is a simple 6 step process. Step 2: Choose two sauces.. 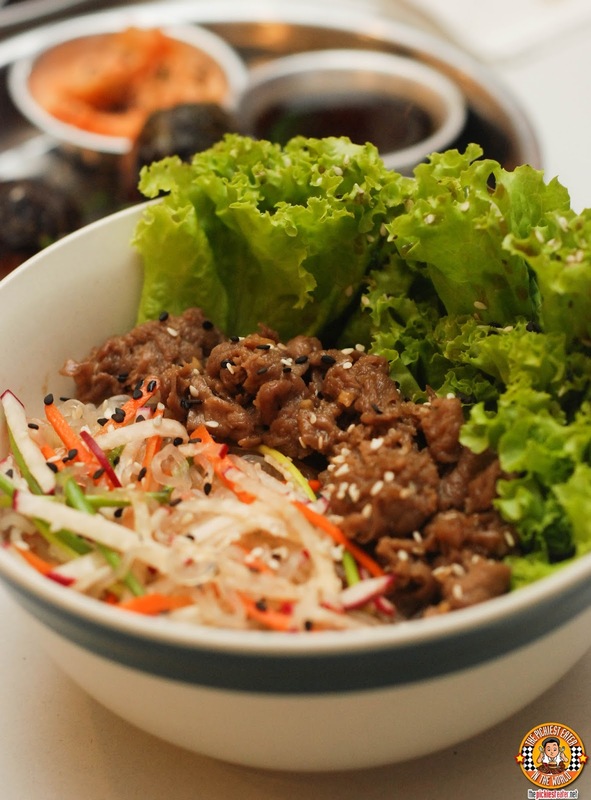 I suggest you NOT choose the Bulgogi sauce, because it will be available in your table as a condiment. However, if you really have your heart set out on it, by all means. But you must NOT miss is the UMAMI BUTTER. Step 3: Choose two proteins. This is amazing because the selection is really well thought out. 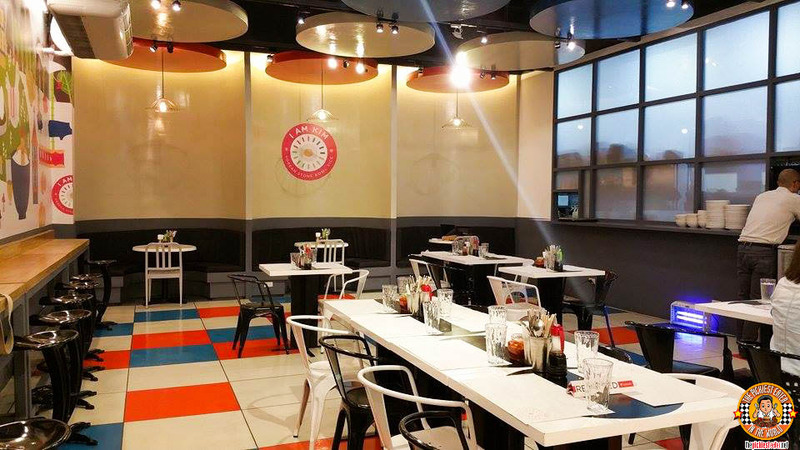 There's something for meat lovers, seafood lovers, and even vegetarians! Step 4: Choose your egg. Rina and I love ours poached, but you can choose to have yours sunny side up or even raw if you like. Step 5: Choose three veggies. Umm.. Onions for me. Too bad no potatoes or squash.. hehe..
Then finally, you choose between a Medium (P350) or Large (P500) bowl. Word of advice, the Medium is big enough for me! 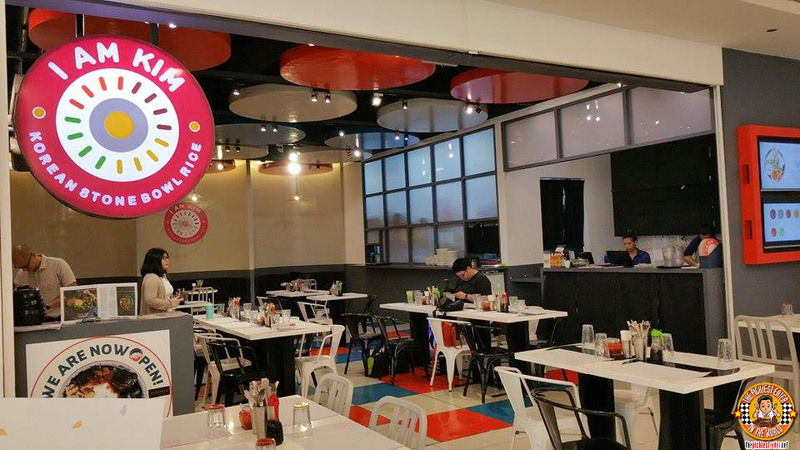 You also have the option of adding Korean Banchan and Ala Carte orders of Korean BBQ if you like, at very reasonable prices. 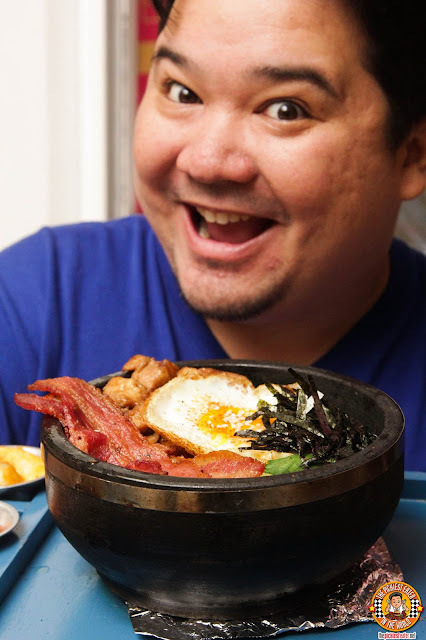 During our visit to I Am Kim, It was our friend Yedy that built her own Bibimbap. She used Japanese Rice, added Umami Butter and the Roasted Garlic Paste, then got Kitayama Wagyu BBQ Short ribs, which she paired with the Grilled Chicken Thigh, rounded out by some shredded carrots, mushrooms and fried onions. This awesome bowl that we named. "I Am Yedy: You're Gonna Hear Me Roar". If you simply want to bury your face into a bowl of Bibimbap, then you can opt to go with the composed Baps. The Classic Bap (P280 M /P370 L) would be a good place to start. You are given a choice between grilled chicken or beef strips, which is thrown into a bowl mixed with Carrots, Spinach, beansprouts, a heaping of Gocuchang, and a egg, either sous vide or raw. My dearest friend, The Mommist, ordered the Salmon & Tuna Bap (P420). I'm really not a fan of raw fish, so I skipped trying this, however this was the second time that The Mommist came her, and as a testament to how delicious this dish is, she refused to order any other dish except this. 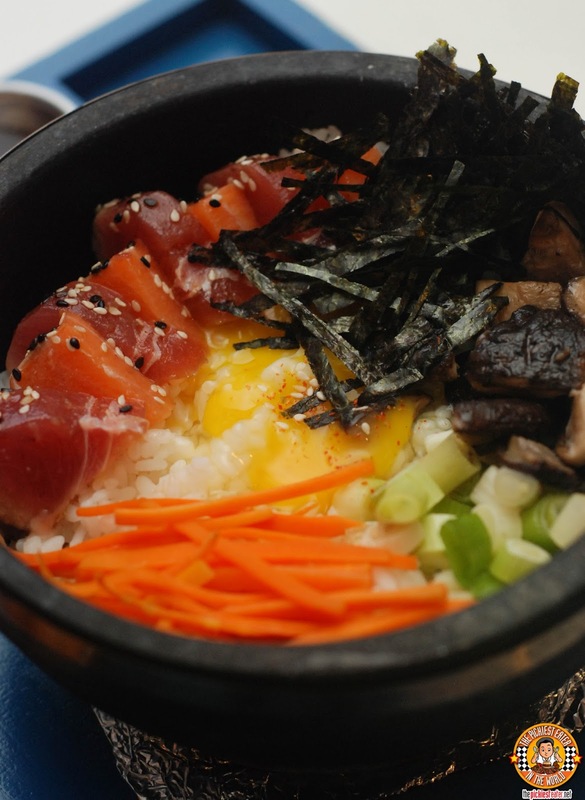 Raw slices of Salmon and Tuna are placed in your bowl, doused in Teriyaki Sauce, with shredded carrots, leeks, Salmon roe, and your choice of raw or Sous Vide Egg. The BBQ Pork Belly (P300M /P435 L) was actually more up my alley. Thin slices of BBQ Pork, had a wonderful sweet-smokiness to it, that melded wonderfully with the shitake mushrooms, gocuchang, and sous vide egg. The meat was so delicious, I didn't mind the sliced zucchini and shredded carrots.. I just kept jamming the food into my mouth with reckless abandon. 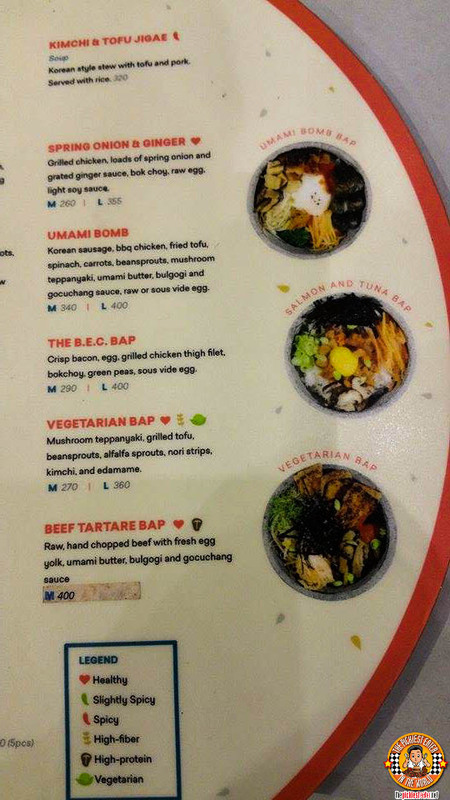 Much to the delight of my buddy, Hefty Foodie, a new addition to the lineup of Baps is the Steak and Eggs with Kimchi Fried Rice (P540). A Kitayama Wagyu Flank steak is seared to absolute perfection, then slathered in I Am Kim's signature Umami Butter. 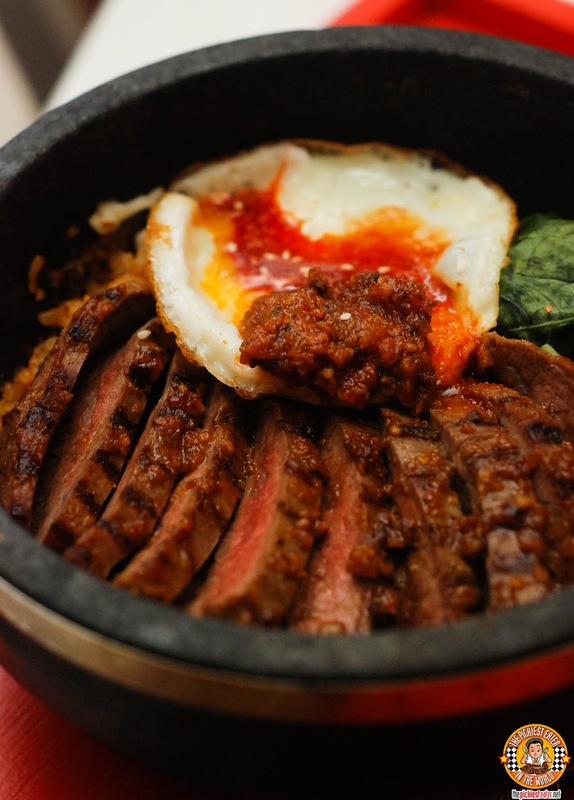 The steak is laid out on a bed of delicious Kimchi Rice, whose acid was balanced by the creaminess of the fried egg and Gocuchang sauce. To put it simply, this was magnificent. Another new addition to the lineup of Baps was one that excited me to no end: The K-Town Burger Steak (P350). I Am Kim's grilled homemade beef patty is practically buried in a very special Gocuchang Cheese sauce, a fried egg and minced Kimchi, all piled up on a bowl of Kimchi Fried Rice. This was really all sorts of excellent. 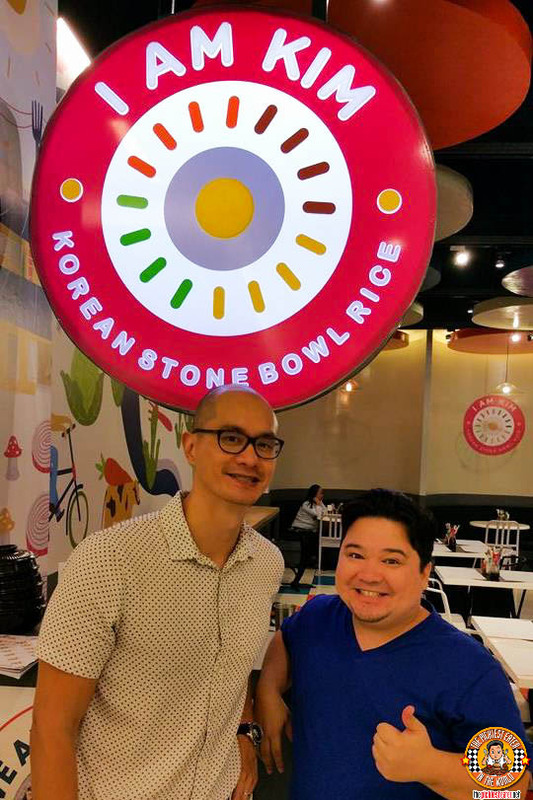 Although I was happy to be able to try the K-Town Burger, I actually ordered something else because at that time, it wasn't on the menu yet. But truthfully, even if it was, I would have still ordered the B.E.C. 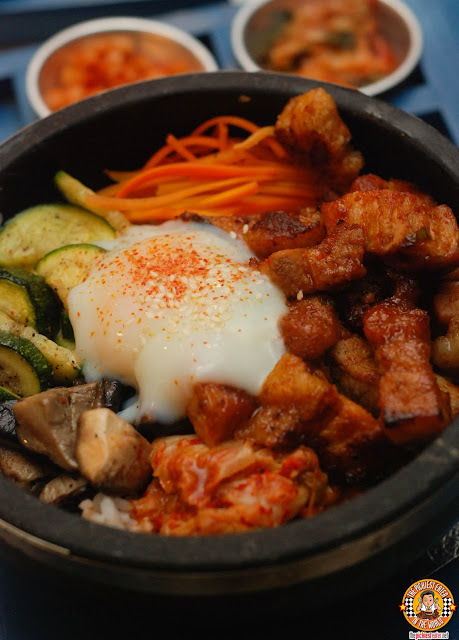 Bap (P290 M /P400 L), which is the dish I've had my eye on ever since I first heard of I Am Kim. Can you blame me? B.E.C. stands for "BACON, Egg and Chicken", so I was sold. A grilled Chicken Thigh Fillet, a perfectly cooked Sunny Side up Egg, mixed with Bok Choy and Green Peas, doused in delightful Soy Caramel sauce. The Bap is then finished with a glorious strip of smokey bacon, that really elevates the dish to another level (as bacon tends to do with all other dishes hehe). Ever since my first visit to I Am Kim, I've had yet another return, which happened last Father's day. I am proud to say that everyone in my family (we were around 15) enjoyed everything we ordered. The service was impeccable and the food was phenomenal. In fact, Rina has been demanding that I take her back ASAP (We're probably going back this week for their 1 Peso Bap Promo!! See Details here!). 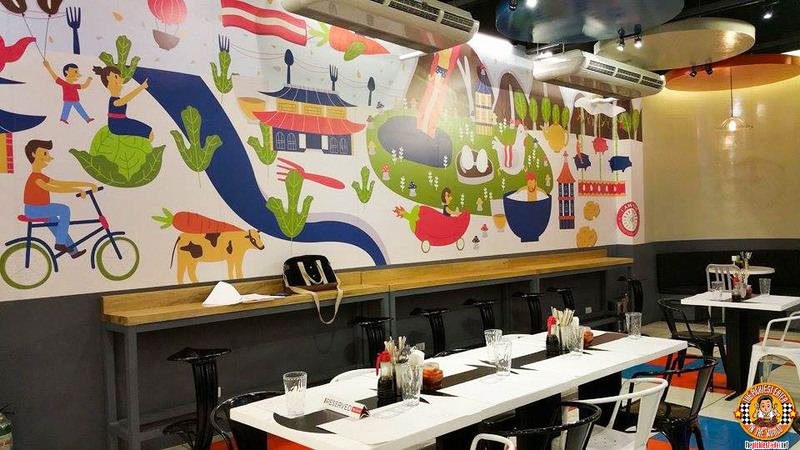 Congratulations to Chef Him Uy De Baron for his latest concept that brings a whole new dining experience to the Pinoy Palette! Like I Am Kim on Facebook! "I Am Yedy: You're Gonna Hear Me Roar" - This cracked me up big effin' time! Haha yan naman talaga yung name, diba??? As you wish, my darling!